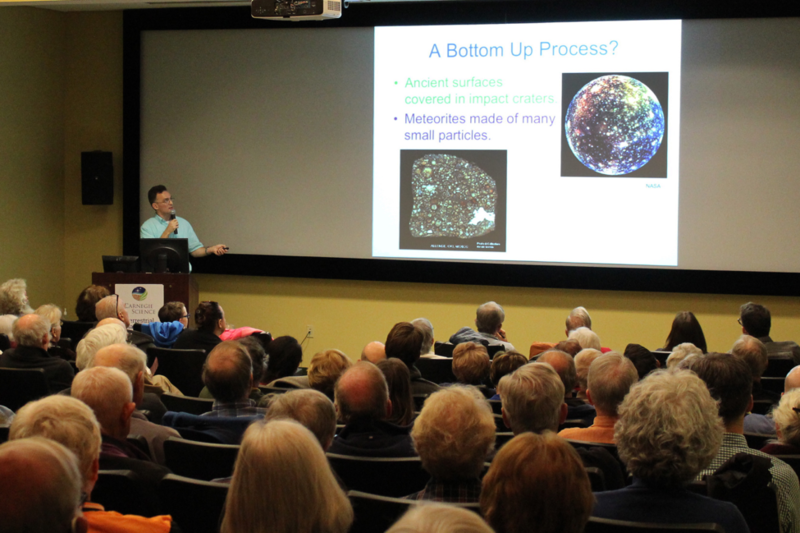 Neighbors and friends of Carnegie's Department of Terrestrial Magnetism gathered at the Broad Branch Road Campus in Washington, D.C. on October 26 for the first Fall 2017 Neighborhood Lecture, "The Mystery of Planet Formation," by DTM Staff Scientist John Chambers. Chambers talked to a packed Greenewalt Auditorium on Thursday, October 26, 2017. During the lecture, Chambers talked about planet formation as a natural process in star formation. He also discussed the possible outcomes of planet formation and factors such as planet size and orbit, which determine a planet's habitability. The recording of the event is also available directly on DTM's YouTube page. Chambers uses computer simulations to study planet formation in different situations of various planetary systems. This work sheds light on the diversity of other systems and the special circumstances that may have led to the formation of our Solar System.